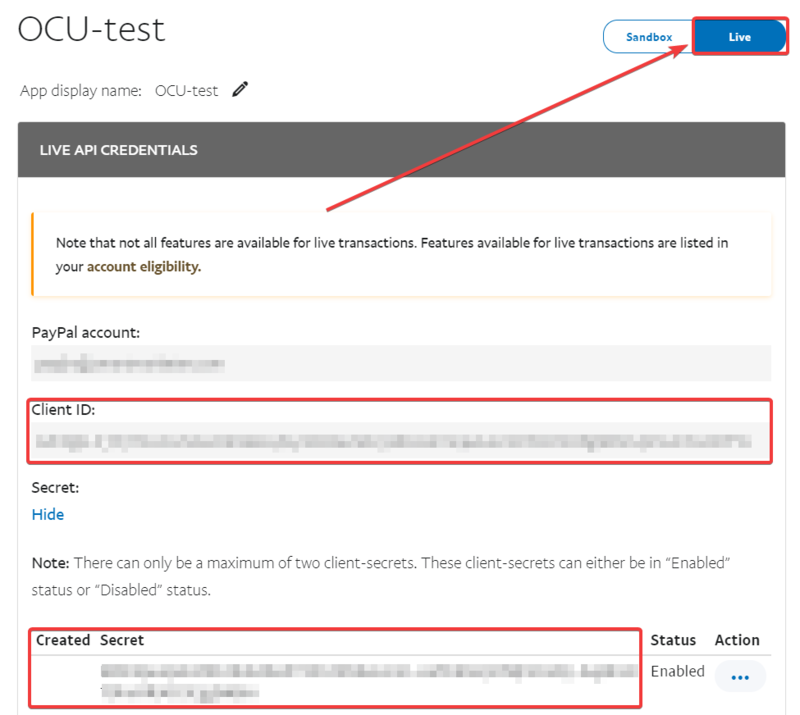 If you're unable to get Reference Transactions enabled for your PayPal account, then use this PayPal integration option for OCU instead. In order to use this integration, you will need a Premier or Business account with PayPal. If you have a Personal account, you can choose to upgrade it after logging in to your PayPal account. Important Note: This integration will give the PayPal option at the "Payment Method" step of the OCU checkout. It does not work with the "PayPal" button on your store's Cart or Checkout pages. 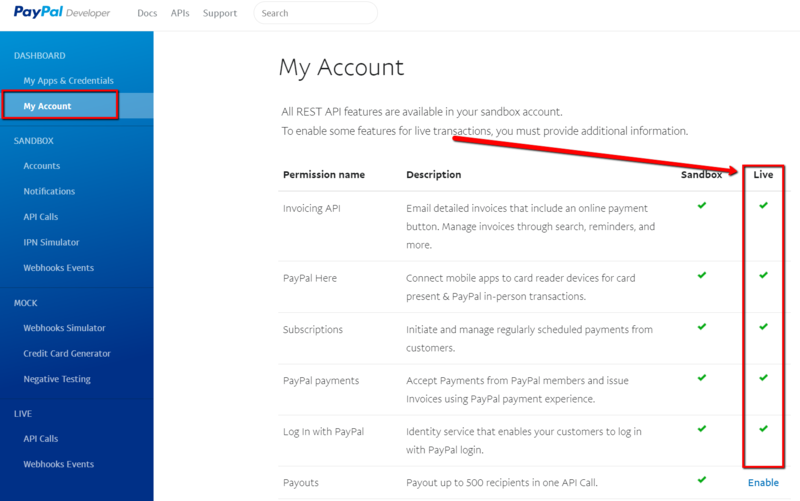 First, you will need to create a PayPal REST API app. This will allow you to get your Client ID and Client Secret. 1. Navigate to https://developer.paypal.com/developer/applications/ in your browser. 6. Navigate back to the Payments > PayPal Express Checkout section within the OCU app. Click the drop-down menu next to the PayPal processor name and select "PayPal Checkout" then click the Save button. Note: You need to disable the app first to make changes to the payment processors. This can be done in the Settings > General section of the app by clicking the Application Status switch to the Off position. 7. Set the Enabled switcher to YES. Paste your API credentials into the appropriate fields. Click on the SAVE button to store your settings and you're done! By default, all credit card logos are shown. You can choose specifically which credit card logos you want shown in-case your store only accepts certain ones through PayPal. 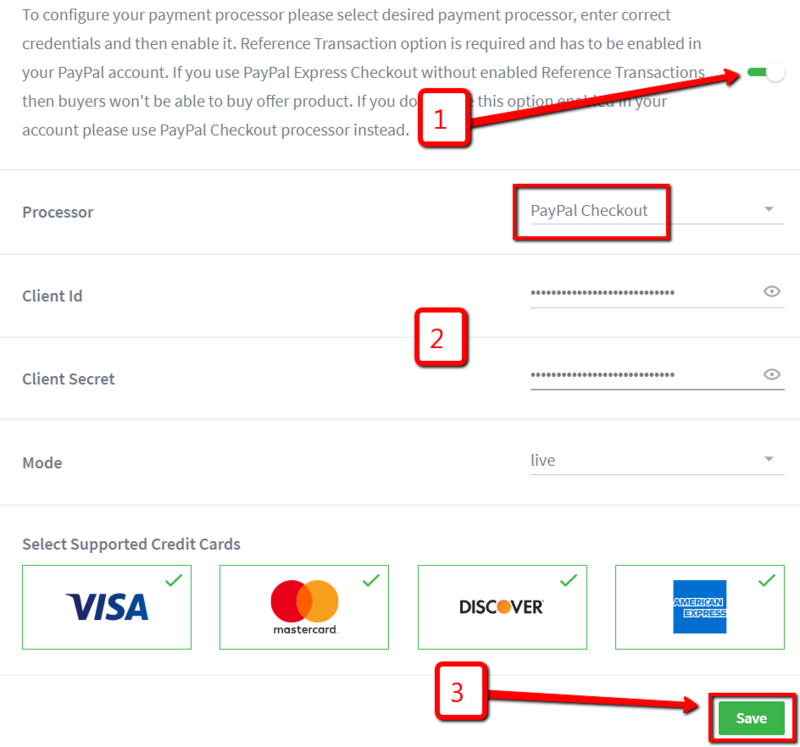 This section allows you to check/uncheck the supported credit card icons you want shown on the PayPal section of the checkout page after the customer signs in to PayPal and is redirected back to Checkout to complete their order. Just make your selections and click "Save". 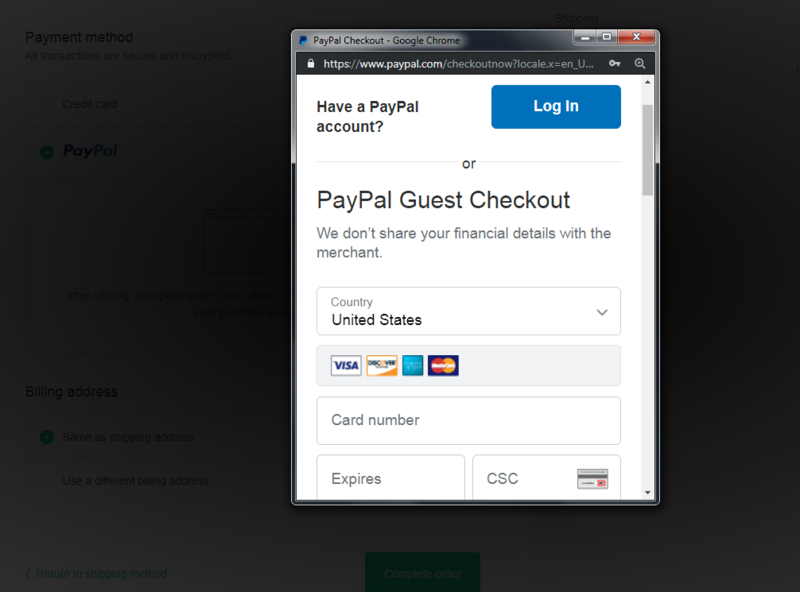 After the customer logs in to PayPal (or uses the "PayPal Guest Checkout" option) and completes payment for the initial checkout order, they will then be redirected to the first OCU upsell offer page. When the customer clicks the "Add To My Order" button on the OCU upsell offer page, a PayPal payment confirmation popup will be shown. The customer will not be required to log back in to PayPal if they've already logged in. 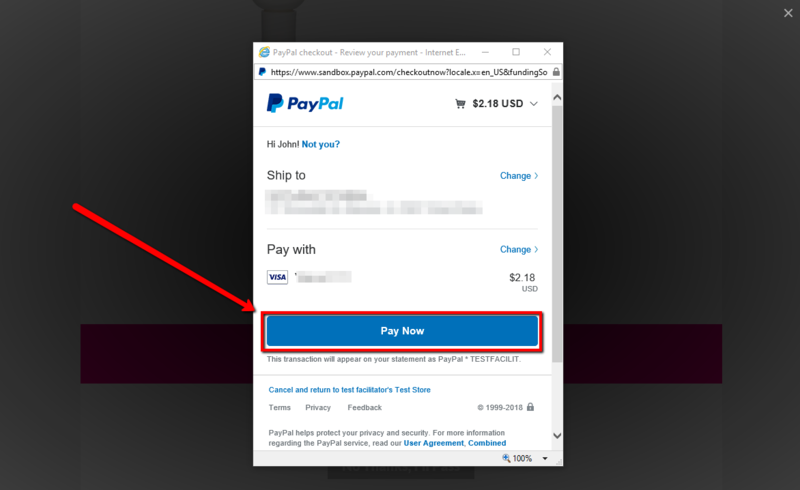 In order to add the upsell product to their order, the customer will need to click the "Pay Now" button on the PayPal popup. When clicked, it will add the item to their order and they will then be redirected to the second upsell offer page. Note: The PayPal payment confirmation popup will be shown each time the customer clicks the "Add To My Order" button on the upsell/downsell offer pages. The offer product will only be added to the order after the customer clicks on the Pay Nowbutton in the PayPal popup. We always recommend the store owner to run through a couple of test orders beforehand so that they know exactly how the app will present the post-purchase offers and to see if any issues arise. To do that, add an upsell tagged product to your cart and then click the checkout button. You should then see the OCU app's checkout launch and you will see "/apps/secure-checkout" in the URL bar if the OCU app's checkout launched successfully. Then, make your purchase using PayPal as the payment method. NOTE: It is important to make a payment of at least $0.50 for the initial purchase in order to see the post-purchase upsell sequence. Otherwise, it will take you right to the Thank You page as soon as the main checkout is completed. You can always refund yourself in your PayPal and Shopify Orders section after making the live test orders as well.